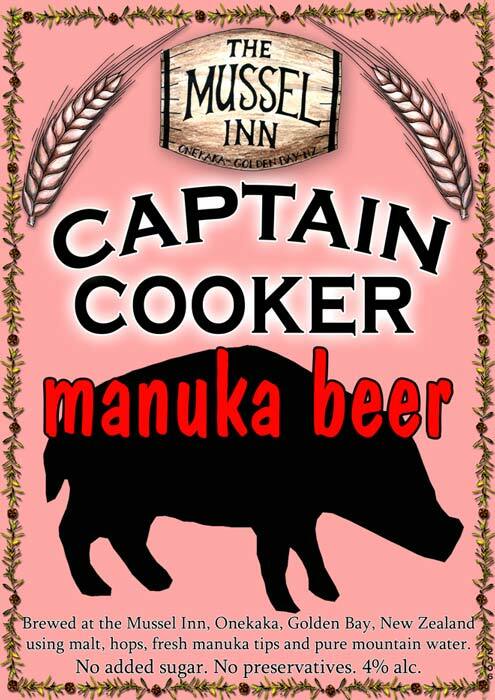 Since 1995, the Mussel Inn at Onekakā, Golden Bay, has been brewing Captain Cooker Manuka Beer, a red-brown beer flavoured with mānuka leaves. The name commemorates the wild pigs that James Cook liberated in New Zealand – they are known as Captain Cookers. Cook brewed ‘spruce beer’ from rimu twigs and mānuka leaves in 1773 at Dusky Sound, with the aim of warding off scurvy in his crew. On its own, rimu foliage made the beer too bitter, so he mixed it with an equal quantity of mānuka leaves.